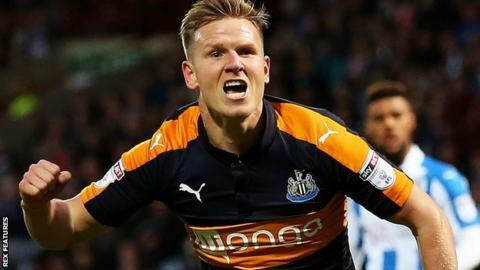 On a day when Newcastle moved a step closer to an immediate return to the Premier League there were compelling stories in each division of the English Football League. BBC Sport looks at five things you may have missed, including a big win for a beleaguered side. It has been widely reported that the last few years have brought some bad times to Aston Villa and their fans. The former European Cup winners were relegated to the Championship last season after a torrid campaign and endured a nine-match winless streak at the start of 2017 that threatened to see them embroiled in yet another relegation battle. However, boss Steve Bruce can now claim to have managed something his six predecessors failed to do. Saturday's 2-0 win at lowly Rotherham was Villa's third in succession. The first time they have achieved that feat since Martin O'Neill's team did it in April 2010 and the first time they've managed to do so without conceding since December 2009. Bruce told BBC WM: "The number of chances we had, I started to think 'is this going to be one of those awful ones?'. "The last time the club managed this we were in the big league so we must understand that. We will get a team that is capable of challenging and that has to be the remit for everyone here." The win did come at a cost with midfielders Birkir Bjarnason and Jack Grealish, who came on as his replacement, both suffering knee injuries. Aston Villa might have had it bad in recent years but few fans have had it quite as bad as Leyton Orient's. Since losing to Rotherham in the League One play-off final in May 2014, having led 2-0, the O's have been relegated from League One, had nine different managers and this week were served with a winding-up petition. To compound their misery they went into today's game at bottom-of-the-table Newport in the League Two relegation zone, eight points adrift of safety. Step forward teenager Josh Koroma. Prior to today the 18-year-old striker had failed to score in his 13 League Two appearances so what better way to open your account in the EFL than with a hat-trick? Koroma's treble plus Steven Alzate's goal gave the O's a huge 4-0 win at the Exiles to move them six points clear of Graham Westley's men and five points adrift of 22nd-placed Notts County. Cod Army marching into the Championship? On Saturday, 12 November Fleetwood fell to a 2-1 defeat at Port Vale to slip to 13th in the League One table. Since then Uwe Rosler's men have embarked on a remarkable unbeaten run which has seen them pick up 41 points in 18 matches to soar up to second in the table. The Cod Army recorded a 2-0 win at Scunthorpe on Saturday to leapfrog the Iron into the second automatic promotion place. Rosler told BBC Radio Lancashire: "There was no way I could have imagined this when I walked in here just before the season started. Nobody could. "I said to the players today that there are two more months to go and they will require a lot of sacrifices, but they could change your life." He added: "This is the best points tally this club has ever had at this level so whatever happens this is the best season in the club's history. "The players have bought in completely to what we do." Despite their league struggles, some eyebrows were raised when struggling Blackburn sacked Owen Coyle just two days after a battling 2-1 FA Cup defeat by Manchester United. Many of those same eyebrows would probably have remained there when Rovers turned to Tony Mowbray to save them from relegation to League One. The former West Brom and Middlesbrough boss endured a mixed time in the third tier with Coventry City and left the Sky Blues firmly in a relegation battle in September. However, seven points from his first three games in charge, including Saturday's 1-0 win over fellow strugglers Wigan, have lifted Blackburn two points clear of the bottom three. "Great credit to the players. They have shown real resilience in these last two games," Mowbray told BBC Radio Lancashire. "I could see from the first day that they were a tight group and it was hurting them being in the bottom three. "We had some warriors out there today but nothing is achieved yet. I think that psychologically being out of the relegation zone is a positive." Stevenage fans could have been forgiven for thinking their season was destined for mid-table obscurity after their 2-0 defeat by Hartlepool on 21 January. After the defeat by Pools, Boro were 15 points off League Two's top three, seven points off the top seven and 10 points above the relegation zone. Since then Darren Sarll's men have gone on a fantastic run of seven wins and one draw in eight matches to haul themselves into sixth and they are now just three points off third-placed Carlisle. Saturday's 3-0 win over struggling Notts County has set the Hertfordshire side up brilliantly for a meeting with the division's other form side, Luton, next Saturday. The fourth-placed Hatters have won three and drawn three of their last six. Preston fans celebrated their traditional 'gentry day' at Fulham. Every year the club choose an away game to pay respect to fellow fans who have passed away in the preceding year, and earlier years, by wearing bowler hats. Sadly the players couldn't mark this year's game with a win, as they fell to a 3-1 defeat.